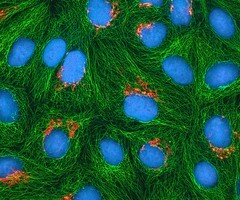 Multiphoton fluorescence image of cultured HeLa cells with a fluorescent protein targeted to the Golgi apparatus (orange), microtubules (green) and counterstained for DNA (cyan). HeLa cells are a cell type in an immortal cell line used in scientific research. It is the oldest and most commonly used human cell line. The line was derived from cervical cancer cells taken in 1951 from Henrietta Lacks, a patient who eventually died of her cancer.